Mawamba Lodge is located at the beach in the midst of the Tortuguero National Park, on a sand bar between the Tortuguero Lagoon and the Caribbean Sea. The Tortuguero National Park is the most important green sea turtle nesting grounds in the Western Caribbean. Heavy annual rainfall make for an abundance of extremely rich flora and fauna in the park, which is made up of a unique system of natural and man-made canals used for transportation and exploration. Admire exceptional flora and fauna including orchids, birds, monkeys, crocodiles, toucans, etc. in their natural habitat. Marine turtles such as the Chelonia Midas (green turtle) emerge from the ocean to lay their eggs in the humid tropical forest from July through September. Guest accommodations consist of 54 comfortable rooms with private bathrooms, hot water, ceiling fans and chairs for a pleasant, relaxing evening. Hotel facilities include two docks on the canals, swimming pool with Jacuzzi, two family-style restaurants with local and international cuisine (one specially designed for groups and incentives), BBQ, bar, souvenir shop, relaxing ranchos with hammocks, natural trails, beach access in walking distance, sand volleyball court, and and conference room where daily lectures on Tortuguero's natural history are presented. 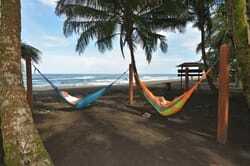 These comfortable accommodations in the heart of a tropical rain forest make Tortuguero your vacation spot! Located 35 miles from the city of Limon and covering almost 47,000 acres, the Tortuguero National Park was established in 1970 for the visitor who craves unlimited wildlife. For bird watchers, Tortuguero offers over 300 species of birds such as herons, hummingbirds, manakins and green macaws, to name a few. Walk the trails, ride the canals or fish to your heart's content. 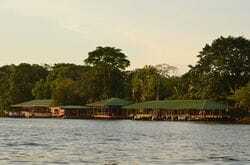 The splendor and magnificence of Tortuguero are for everyone to experience. Visit one of the most fascinating areas of Costa Rica, the Tortuguero National Park, the most important nesting grounds for the Green Sea Turtle (chelonia midas) in the Western Caribbean. Be on the right side of Tortuguero and experience it, staying where the experts stay! 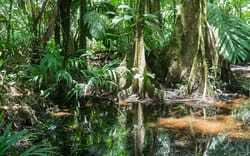 This park is also called Costa Rica's Amazon because of its canals and surrounding rain forest. 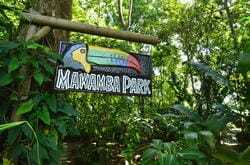 Due to the heavy annual rainfall of the area, and extremely rich flora and fauna abound in this park. Here you can observe orchids, birds, monkeys, crocodiles, sloths and toucans in a unique system of natural and man-made canals that serve as waterways for transportation and exploration. The Lodge offers a variety of tours to the canals of the National Park, turtle nesting observation (seasonal July - September), hikes into the lush rain forest of the area, bird watching and night tours conducted and supervised by specially trained guides using the best equipment and implementing all necessary safety precautions.In Tortuguero, you are only minutes away from world-class tarpon and snook fishing. When they say world-class, they are talking about snook averaging 20 lbs and tarpon weighing in at an average of 75 lbs. The seasons for both run from January - May and from July - September. All tours and fishing trips can be arranged by the Lodge, or see Anglers Connection for further information.